Hydraulic bale grab for quick and efficient moving and stacking of bales. 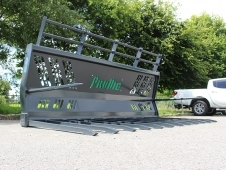 Hydraulic bale handler for quick and efficient moving and stacking of bales. Hydraulic grab for moving and stacking large square and round bales. ProDig Beet Chopper and Meal Feeding Bucket is available in three sizes from 2m to 2.5m which will suit tractor loaders, telehandlers, articulated loaders & Tractor 3 Point Linkage. Large capacity shear grab from 1.5m, 1.8m, 2.2m , 2.5m in width. Wide opening shear to split round bales in half. Available in widths of 1.5m, 1.8m & 2.2m. 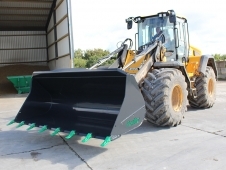 The ideal attachment for use in conjunction with a diet feeder wagon. Shear Grabs from 1.3m, 1.5m, 1.8m & 2.2m in width. HARDOX tines or drop forged round tines available.